Recruit a walking buddy who pushes you to walk quickly. 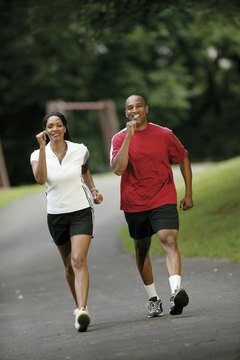 Walking daily can help shed pounds, reduce muffin tops and eliminate love handles. A 2013 study published in the “American Journal of Preventive Medicine” found women who regularly walk to work have lower body mass indexes, and lower risks for obesity. However, your workout duration and total calorie intake determine how much weight you’ll lose walking every day for a month. You can safely shed 1 to 2 pounds weekly, or 4 to 8 pounds in a month, according to the Centers for Disease Control and Prevention. This weight-loss rate is safe, and can help you keep the weight off for good. To accomplish this feat, burn an extra 500 to 1,000 calories a day walking -- since 3,500 calories equals 1 pound of body weight -- or combine exercise with calorie restriction to peel away up to 8 pounds in a month. You can drop weight quickly -- up to 5 pounds weekly or 20 pounds in a month -- walking regularly and limiting your intake to 800 calories a day, according to Weight-Control Information Network. However, such very low-calorie diets (VLCDs) are only safe under medical supervision and may be unpleasant. VLCDs can cause nausea, fatigue, diarrhea and gallstones, Weight-Control Information Network reports. 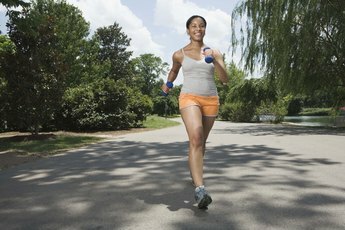 The longer you walk, the more pounds -- and body fat -- you’ll melt away. A review published in 2009 in “The Ochsner Journal” recommends overweight and obese women exercise 45 to 60 minutes, five to seven days weekly to shed pounds. Authors of this review suggest after 30 minutes of exercise, your body’s main fuel source shifts from carbohydrates to fat stores. The faster you walk, the more calories you’ll expend, which is good news if you’re a power walker. Harvard Health Publications reports 155- to 185-pound women burn 298 to 356 calories walking 3.5 miles per hour for one hour, and 372 to 444 calories in an hour walking 4.5 miles per hour. 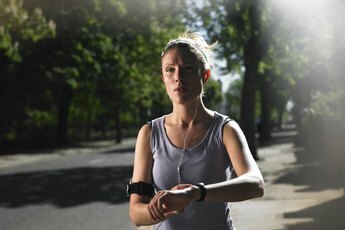 Double that duration to two hours, and a 155- to 185-pound woman expends 596 to 888 calories walking at a pace of 3.5 to 4.5 miles per hour. Unless you have unlimited time on your hands, you’ll likely have to reduce your calorie intake in addition to walking every day to lose 8 pounds in a month.